In February of 1957, a group of about 80 faithful founded Knollwood Baptist Church, meeting at a local funeral hall until their first chapel was completed in July. More than half a century later, Knollwood's congregation numbers in the thousands, and their 1000-seat sanctuary offers multiple services each week. 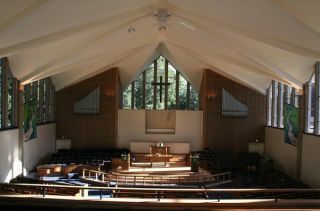 The sanctuary's modernistic design features soaring peaked ceilings, abundant glass, and polished surfaces. But that same design has long been problematic for the church's technical staff, who have struggled to achieve intelligibility and even coverage in the hall. As Dan Wood, president of High Point, NC-based Church Interiors Audio Video (CIAv) explains, the sanctuary's recent renovation was an ideal opportunity to finally tackle the audio issues. "It's a beautiful space, but very challenging acoustically, and the original sound system just couldn't provide adequate coverage," said Wood. "Church Interiors was undertaking a major renovation, and it was a perfect time to rethink their audio system." The room's airy, open architecture presented some significant challenges - particularly the chancel area's wide design. "The chancel platform extends far into the room, and there was no possibility to hang an array or cluster without impacting line of sight," Wood said. "Our only viable option was to locate the speakers behind all the open microphones - there was simply no other place to put them. "The Iconyx allowed us to create multiple sound beams and steer them to the seats on the floor and balcony levels, while steering them away from the walls and windows and other reflective surfaces," said Wood. "It also enabled us to provide focused coverage to the mix position up in the balcony."